Bangladesh - IOM, the UN Migration Agency, has launched an appeal for USD 3.7 million to help Rohingya migrants living in settlements in Bangladesh affected by Cyclone Mora. The storm hit the country’s coastline around Cox’s Bazar early on Tuesday. The cyclone, which brought 117 km/h winds and heavy rain, tore into the makeshift settlements and host communities. The settlements house over 130,000 ethnic Rohingya, who are also known in Bangladesh as Undocumented Myanmar Nationals (UMNs). The storm destroyed 25 per cent of shelters and left as many as 80 per cent damaged. Food and fuel supplies were destroyed, electricity lines were cut, and health and sanitation infrastructure was also badly damaged. The IOM appeal, which aims to help up to 80,000 people in the makeshift settlements and host communities between now and year end, will target health, water, sanitation, shelter and protection. IOM emergency response staff working in the settlements say that repairs to water and sanitation facilities are a top health priority. The storm knocked out 243 latrines, as well as tube wells that desperately poor residents depend on for clean water. Shelter and non-food relief items, including plastic sheeting, mosquito nets and blankets, are urgently needed for the estimated 17,000 families who lost their homes. Infrastructure, including water and sanitation, has come under increasing strain in Cox’s Bazar in recent months. Since violence erupted in Myanmar’s Northern Rakhine State in October 2016, over 75,000 UMNs have crossed the border to seek safety in Bangladesh. 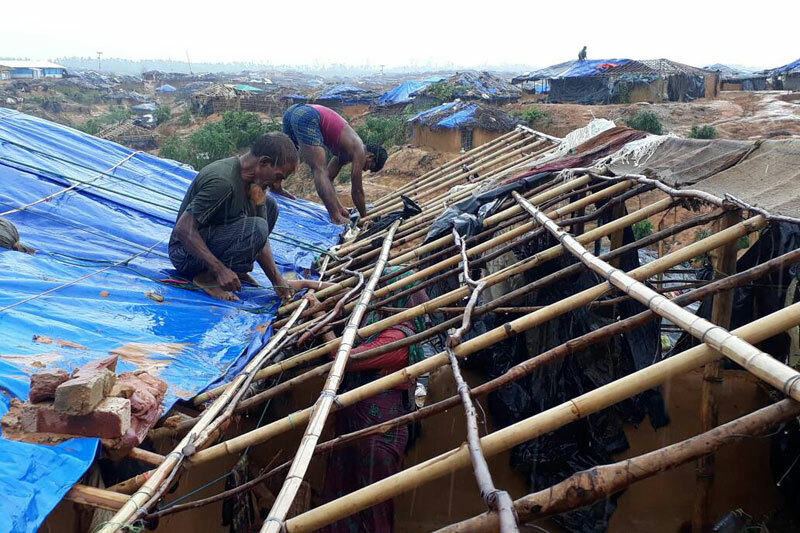 Most of the affected are now living in makeshift settlements around Cox’s Bazar, where IOM provides site management and coordinates the work of other aid agencies in three settlements housing 103,000 people. The UN Migration Agency, which has worked with Undocumented Myanmar Nationals and host communities in Cox’s Bazar since 2014, also provides water, sanitation assistance, shelter, healthcare and protection from gender-based violence in the three settlements. For more information, please contact Shirin Akhter at IOM Bangladesh, Tel. + 880 1711 187 499, Email: sakhter@iom.int, Tel. + 880 1711 187 499.